The purpose of this post is to demonstrate plotting of graphs in text mode using printable characters. I would be taking a simple case in which the x-axis is aligned vertically, like shown in the adjoining figure, because cursor cannot move up in the text mode. 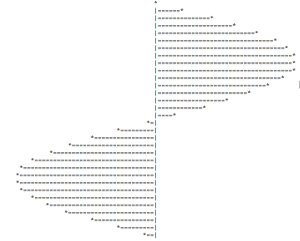 However, the same can be aligned horizontally by using a double dimension array to first store the plot and then display it using nested loops, but I am going to keep that for some other post. I would be giving two implementation one in which the asterisk would represent the graph (unshaded sine graph) and the other in which the space between asterisk and the axis would be filled with the character ‘=’ to give it a shaded appearance, like shown in the figure above. The function to determine the sine of an angle in radians in Java is Math.sine( ). Math.sine() returns a value between -1 and +1 (both inclusive) depending on the argument. In order to get a nice plot we will leave five columns of space from both sides. Let us assume that we want to plot from column 5 to column 80 only. So, the problem is essentially to scale the value obtained from Math.sin() between 5 and 80. This can be achieved easily using the following formula. This entry was posted in Code & Logic on February 17, 2015 by Vinay Singh.